Google has opened an online photo gallery that will feature millions of images from Life magazine’s archives that have never been seen by the public before. The Time Life Photo Archive, today’s site of the day, features medium quality photographs from as early as the 1860s. 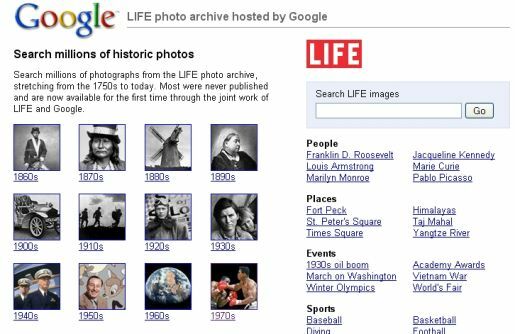 The new service, available at http://images.google.com/hosted/life, debuted Tuesday with about 2 million photos. Eventually, Google plans to scan all 10 million photos from Life’s library so they can be viewed on any computer with an Internet connection. About 97 percent of Life’s archives have not been publicly seen, according to Life. The photos can be printed out for free as long as they aren’t being used as part of an attempt to make money. Time Warner Inc., Life’s parent company, hopes to make money by selling high-resolution, framed prints. The orders will be processed through Qoop.com. Life’s archives include photos from the Civil War as well as some of the most memorable moments from the 20th century, including the Zapruder film capturing John F. Kennedy’s assassination. Google has been indexing a wide variety of information that previously wasn’t available online as part of its efforts to lure even more traffic to its popular search engine. For the past four years, Google has been scanning millions of books stored in dozens of libraries around the world. The Life partnership represents Google’s biggest undertaking in professional photography. Google hopes to work out similar arrangements with the owners of other large photo archives, said R.J. Pittman, a director of product management.